What technology is influencing the future of ERP? Some people are terrified of technology advancements and the unknown consequences of unleashing a Pandora’s Box of artificial intelligence (AI), robotics, the cloud and the internet of things (IoT). Others are ecstatic about the speedy improvements to people’s (and businesses’) quality of life by replacing everyday struggles with clever tech solutions. Technology development is forever galloping towards the promise of an easier, better, longer life. The elimination of hard, laborious work leads to the transformation and reformation of jobs that we can’t even imagine yet. But is this practically useful to businesses? What comes to mind when you think of future technology? Drones delivering your Amazon order? A creepy humanoid taking your order at McDonalds? Those marine robot dogs with no heads battling foreign enemies? Driverless cars picking up your kids from school? All of these things make great news headlines, but what changes are actually going to impact real business (including ERP) computing over the next few years? MYOB recently presented about this to an Endeavour client function. We take a look at some of their insights into how AI, data and the multi-cloud world is impacting the way we do business. Artificial intelligence (AI) describes the apparent intelligence of a non-living machine – anything from a family’s personal computer, to a humanoid robot. The speed at which AI is developing means that it will eventually exceed the natural intelligence of humans. 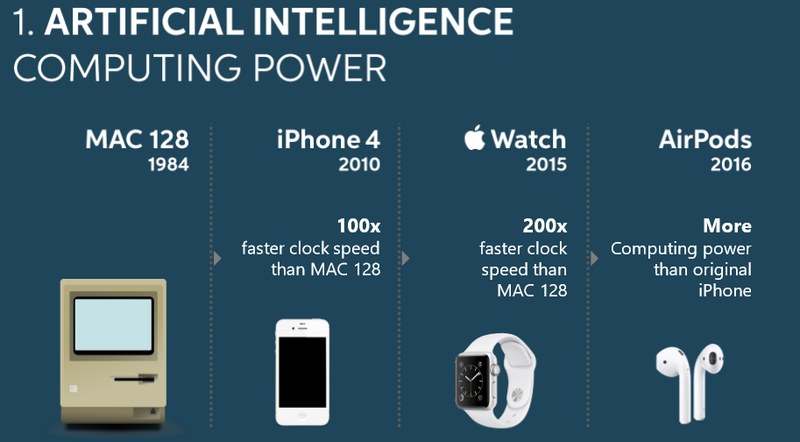 Over the past 25 years computing power has sped up over 200x since the MAC 128 was introduced in 1984, while the size needed to encapsulate this computing power has decreased, resulting in tiny but powerful technology devices, and small but incredibly powerful technology devices. There are three main categories of AI – narrow, general and super. Super AI currently falls into the science fiction category. It refers to agents of intelligence far surpassing the brightest human minds, with extraordinary problem solving and creativity abilities. General AI is in its infancy stage and describes an entity with multiple focusses and the ability to apply self-learning. It can also reason. The most relevant type of AI technology for ERP business processes today is ‘Narrow AI’. Also known as ‘weak’ AI, it is focussed on one task, is able to self-improve, but is not able to learn outside its field of use. Broad examples of narrow AI include chat bots, self-driving cars, Amazon purchase guidance or closer to home MYOB SmartBills MYOB MyAdvisor, and chatbots. What AI tech has MYOB been working on? MYOB have been utilising AI for OCR and extraction and Natural Language Generation. They have also started to experiment with chatbot interfaces to help with capturing and categorising expenses, and to categorise encoded transactions. SmartBills allows a customer to upload or email a supplier invoice into their company file. On receiving this invoice the product attempts to read (with OCR) the invoice and auto populate fields when creating a Bill. The background technology (Xtracta) uses machine learning to improve the reading of invoices with accuracy over 90%. MyAdvisor is an advisory reporting solution that utilises Natural Language Generation (NLG) to prepare financial reports that have plain English commentary and recommendations. Natural Language Processing (NLP) and NLG are the underlying technologies used in much of the chatbot and speech based interfaces. MYOB’s cloud based ERP, MYOB Advanced Business, has created a proof of concept chatbox using Microsoft Skype for capturing expenses. In the prototype you can nominate to create an expense and allocate to an expense type as well as upload an image of a receipt for the expense. Although they do sound a bit daunting at first, it’s exciting that AI, the internet of things and the cloud goes beyond simply being futurist buzzwords. MYOB has demonstrated that they’re taking these forms of technology seriously, and that there are real, beneficial tools that you can utilise now to cut ERP time, effort and resources in your business. For now, this isn’t so much a threat to your job, but more an opportunity to grow, and focus on the more strategic, creative, ‘human’ side of your role, that machines can’t do… yet. To learn more about how MYOB is developing technology to enhance your business, contact us to access the latest MYOB Greentree Product Roadmap Update.